Vol. 9, Issue 361 • Saturday, December 25, 2004 • Mele Kalikimaka! VICTORY! 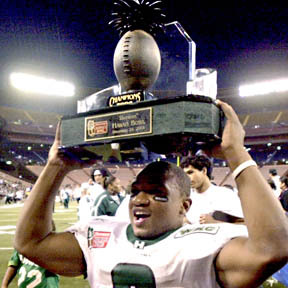 Hawaii's Michael Brewster held up the trophy for the Sheraton Hawaii Bowl yesterday as he walked off the field at Aloha Stadium. The Warriors beat the University of Alabama-Birmingham Blazers, 59-40.